My friend Tina always claimed that the only relationship in her life which hadn’t been dysfunctional was with a Jack Russell Terrier. Exasperated by men both specifically and generally, she went searching for loving company in the shape of a large grey rescue Siamese by the name of Claude. They made the perfect couple. He was clean, polite and affectionate and didn’t shed too much fluff around the house. All he asked in return was food and cuddles. 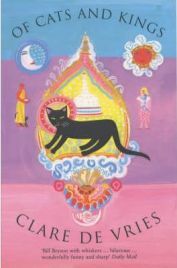 With a friend like Tina, when I heard that writer Clare de Vries had taken her Burmese cat Claudius travelling with her for a year, it all made complete sense to me. And when Claudius died, Clare decided to hit the road again and go in search of perfect feline love. Since she would only consider a Burmese or a Siamese, she decided to go – not so surprisingly – to Burma and Thailand. ‘Of Cats and Kings‘ is her account of her search for the perfect cat and all the weird stuff she learned along the way about travelling, other people, cats and love. I could tell you that we have a Burmese cat but it’s a lot more true to say we are occasionally graced with the company of a blood thirsty killer with commitment issues by the name of Baloo. No woman in search of a reliable companion would pick a Burmese like him. Whilst I love to imagine hitting the road with my boy Baloo riding shotgun, I fear he’d be off slaughtering the local wildlife and mugging pensioners rather than acting as a travel companion. None the less, as a lover of both travel and cats, this book was right up my street and I made a swap for it on the book exchange site ‘Readitswapit’ and as soon as I’d finished the very heavy autobiography that had been getting me down for a week, I eagerly moved on to read about Clare’s adventures. I couldn’t help but like Clare de Vries almost from the first page even though she kicks off with the kind of dippy ‘I’m such an unlucky airhead who can’t keep a bloke’ pitch that would normally have me reaching to put the book back on the shelf. I can forgive all of this because she had me roaring out loud before she’d even left the country. She tells a date she can’t eat wheat or dairy because she’s got candida (a yeast infection). He never calls again, thinking she meant Chlamydia (a sexually transmitted infection). Then there’s the Brazilian boyfriend she dumps for calling her ‘Linda’ in bed, not realising it’s Portuguese for pretty. When she tells her latest soon to be ex-boyfriend that she plans to go to Burma and Thailand in search of a perfect cat, he asks why she’s not off to Persia and Constantinople at the same time. Her Sloany friend Camilla introduces her the Burmese ‘King in Exile’, a chap so objectionable that it’s not hard to imagine that a military Junta might be more fun. First stop Burma where she’s torn between a desire to avoid putting her travel pounds in the pocket of the corrupt and exploitative military government and the need to hide from all the misfit travellers who are tailing her round the country. I found it so easy to recognise the smelly hippies and people who argue over every last penny just because they’re desperate not to be ‘taken advantage of’. I’ve wondered for a long time whether it’s right or wrong to go to Burma but after reading this book, I have the impression that even if there were no ethical issues, it doesn’t sound like somewhere I’d want to put on my list. My late grandfather would have agreed – he used to say ‘I went abroad once, I didn’t like it’. He spend World War 2 in Burma fighting the Japanese – that’s enough to put anyone off a destination. Cats are in short supply and someone does point out that Burmese cats don’t actually come from Burma – those apparently are ‘Birman’ cats, a totally different bunch – but she carries on regardless. Only after a forced return home due to a lost ticket (lost in the worst way) does she plan her Thai visit. Thailand also proves to be an uncomfortable place full of exploitative people – both travellers and locals. A man on a plane shows her a photo (on his phone) of his Thai girlfriend whom Clare describes as ‘totally naked’ and ‘very supple’. The incessant sense that everyone wants a slice of her wallet is draining but at least there are lots more cats to see. She finds her perfect kittens in a temple but the monk who lives with them isn’t sure he wants to let them go, even though the little cats tell her and him they want to be with her. Clare ‘talks cat’ you see – and it’s a pretty universal language. She also has hallucinations in which Claudius gives her advice about Buddhism and her search for happiness – he’s often wearing a smoking jacket and sitting cross legged, pontificating like Noel Coward, making her wonder if Claudius is ‘gay’. Could this be what the Burmese fortune teller meant when he told her she had ‘a goat’ who she loved and wasn’t frightened of? De Vries has a fabulous ear for accents and she recreates many of the traveller conversations with locals that anyone who’s been pretty much anywhere in Asia will recognise. This was published in 2002 so there are lots of discussions about ‘Manhesta Oonited’, ‘Davee Bekkum’ and ‘Po Spice’ which will resonate with everyone who’s been drawn into a discussion about what the world associates with the UK. A man tells her that the bird she can hear is an ‘oohdwal’ spelled ‘oo weebelwee low’ – an owl, of course. She foolishly asks a man how old he thinks she is and he says mid-thirtees. She tells him she’s 30 and he tells her she should get ‘plastic sujjily’. The pages of Of Cats and Kings are filled with these rich little observations of her conversations with the people she meets and every one of them rings true. She avoids the typical travel writers’ tendency to over-do the information on where she goes and what she sees. She tells us enough to briefly describe what she’s seen and why she went there without boring us with too much detail – and most importantly, she keeps looking for kitties. Bad things happen. She gets dumped by the side of the road in the middle of nowhere after missing her bus stop, she gets robbed, she gets pursued by annoying people, drugged, exploited, overcharged and bored but I enjoyed her journey the whole way. At times I questioned what I was doing reading a book by a woman who thinks she speaks cat and sees a ghost kitty and takes his advice but I was willing to overlook her more extreme eccentricities because she’s just so intensely likeable and able to see the good and funny in almost every situation. I knew there would have to be a happy ending – anything else just wouldn’t be acceptable – but I didn’t spot where it was coming from or how it would play out. Love and cats don’t always pop up when you go looking for them, and sometimes it’s only when you stop looking that you can find either. That’s a pretty good moral for a story of cats and kings. One Comment on "Of Cats and Kings"